As the aortic valve narrows, the left ventricle has to work harder to pump blood out through the valve. To do this extra work, the muscles in the ventricle walls become thicker. This can lead to chest pain. Aortic stenosis may be present from birth (congenital), but most often it develops later in life. Children with aortic stenosis may have other conditions present from birth. 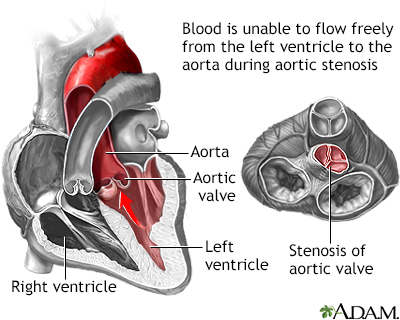 Aortic stenosis mainly occurs due to the buildup of calcium deposits that narrow the valve. This is called calcific aortic stenosis. The problem mostly affects older people. 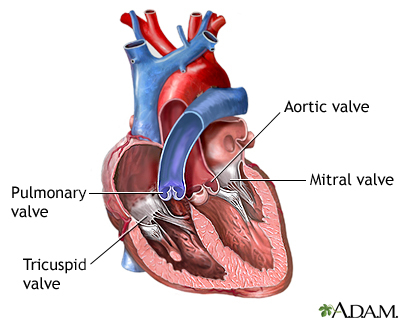 Calcium buildup of the valve happens sooner in people who are born with abnormal aortic or bicuspid valves. In rare cases, calcium buildup can develop more quickly when a person has received chest radiation (such as for cancer treatment). Another cause is rheumatic fever. This condition can develop after strep throat or scarlet fever. Valve problems do not develop for 5 to 10 years or longer after rheumatic fever occurs. Rheumatic fever is becoming rarer in the United States. Aortic stenosis occurs in about 2% of people over 65 years of age. It occurs more often in men than in women. Most people with aortic stenosis do not develop symptoms until the disease is advanced. The diagnosis may have been made when the health care provider heard a heart murmur and performed tests. Chest discomfort: The chest pain may get worse with activity and reach into the arm, neck, or jaw. The chest may also feel tight or squeezed. Fainting, weakness, or dizziness with activity. Children with mild or moderate aortic stenosis may get worse as they get older. They are also at risk for a heart infection called bacterial endocarditis. A heart murmur, click, or other abnormal sound is almost always heard through a stethoscope. The provider may be able to feel a vibration or movement when placing a hand over the heart. There may be a faint pulse or changes in the quality of the pulse in the neck. Aortic stenosis is most often detected and then followed using a test called a transthoracic echocardiogram (TTE). Regular checkups by a provider may be all that is needed if your symptoms are not severe. The provider should ask about your health history, do a physical exam, and perform an echocardiogram. People with severe aortic stenosis may be told not to play competitive sports, even if they have no symptoms. If symptoms do occur, strenuous activity must often be limited. Medicines are used to treat symptoms of heart failure or abnormal heart rhythms (most commonly atrial fibrillation). These include diuretics (water pills), nitrates, and beta-blockers. High blood pressure should also be treated. If aortic stenosis is severe, this treatment must be done carefully so blood pressure does not drop too far. In the past, most people with heart valve problems were given antibiotics before dental work or a procedure such as colonoscopy. The antibiotics were given to prevent an infection of the damaged heart. However, antibiotics are now used much less often before dental work and other procedures. Check with your health care provider to find out whether you need antibiotics. People with this and other heart conditions should stop smoking and be tested for high cholesterol. Surgery to repair or replace the valve is often done for adults or children who develop symptoms. Even if symptoms are not very bad, the doctor may recommend surgery based on test results. A less invasive procedure called balloon valvuloplasty may be done instead of or before surgery. A balloon is placed into an artery in the groin, threaded to the heart, placed across the valve, and inflated. However, narrowing often occurs again after this procedure. A newer procedure done at the same time as valvuloplasty can implant an artificial valve. This procedure is most often done in patients who cannot have surgery, but it is becoming more common. Some children may need aortic valve repair or replacement. Children with mild aortic stenosis may be able to take part in most activities. The results of aortic valve replacement are often excellent. To get the best treatment, go to a center that regularly performs this type of surgery. Call your provider if you or your child has symptoms of aortic stenosis. Also contact your doctor right away if you have been diagnosed with this condition and your symptoms get worse or new symptoms develop. Lindman BR, Bonow RO, Otto CM. Aortic valve disease. In: Zipes DP, Libby P, Bonow RO, Mann DL, Tomaselli GF, Braunwald E, eds. Braunwald's Heart Disease: A Textbook of Cardiovascular Medicine. 11th ed. Philadelphia, PA: Elsevier; 2019:chap 68.